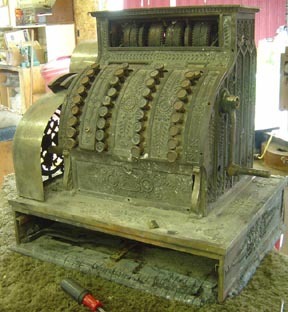 One of the most frequently asked questions concerning cash registers is: “Should it be restored, or be left in its original condition?” Antique cash registers fall into the same category as classic automobiles. They are business machines that were purchased to perform a specific function. As soon as they were no longer functional, or something better came along, they were replaced. They were definitely not intended to be a cherished antique, passed on from generation to generation. Like a classic car, an antique register that is properly restored is more eye appealing and valuable than one in its original condition. 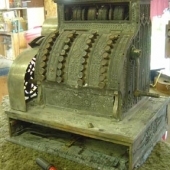 Most antique cash registers when found are dirty, not working, and usually missing a part or two. A lot of the registers that we see have one or many coats of paint on them, because when the store was being painted, it was easier to leave the cash register where it sat, so the cash register got a coat of paint, too. In this case, a complete restoration is definitely the best way to turn the machine into something that you would display in your home or office. 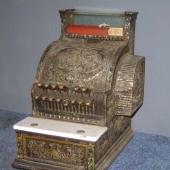 In the event you own a cash register that is in nice, clean original condition, it too would increase in value with restoration. However, if you like the look that only time can put on brass, you may decide to display the machine in this condition. 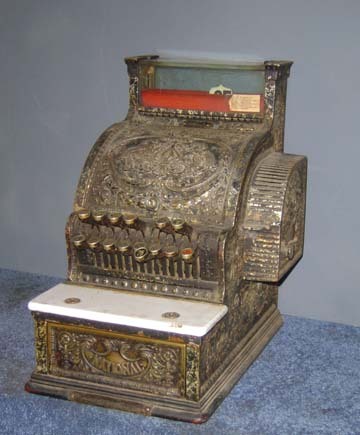 Most collectors have cash registers in their collection that are both restored and unrestored. 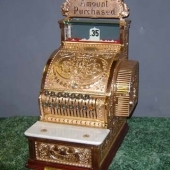 However, it is an undeniable fact that a properly restored brass cash register adds a “certain something” to the room in which it is displayed. 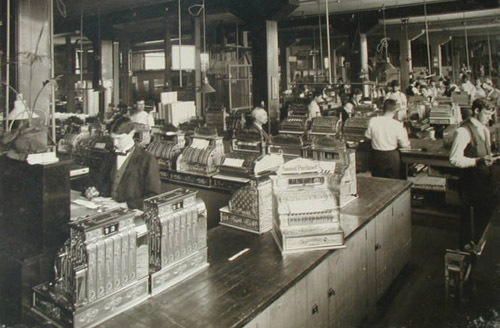 The HBAC Group has been restoring antique cash registers for over 30 years. We are the only business in the world that devotes 100 percent of our efforts to the restoration of antique cash registers. You can be assured that when the HBAC Group restores an antique cash register for you, that the machine will return to you as you would have seen it on the National Cash Register Co. showroom floor. We treat every cash register as if it were one of our own, and we do not replace existing original parts with reproduction parts when a register is in our shop for restoration. We also do everything ourselves. We are the ones who will polish your register, will restore the mechanism and the wood. 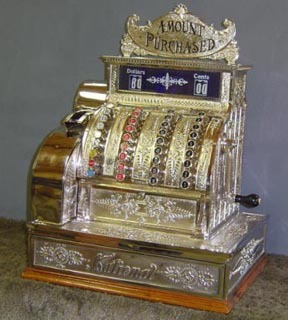 Also, because we are the parts source for antique brass cash registers, we supply all of our own parts. 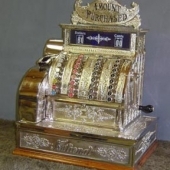 There are some businesses who restore antique cash registers on a part-time basis, but more than likely they purchase their parts from us, or even have us perform some of the work, driving the cost of restoration higher. First, we completely take the register apart. We oil the mechanism and make sure that all of the insides are working properly, including any counters. The key arms aretaken out of the regster, stripped, polished, re-nickeled and replaced back into the register. We take the brass pieces and polish the pieces in our professional buffing room, specifically designed for polishing brass cash register parts. We then apply a heat-cured lacquer so that the pieces will stay in the polished condition. If the register was originally a nickel-plated register, we strip all of the old remaining nickel off of the brass, and then buff the brass pieces. We then re-nickel the pieces just like the register was originally. Our nickel plate is a cadnium nickel plate, which was originally used by National and does not have the “chrome” look. All of the wood on the register is restored, which is usually the drawer and any type of wooden base that may be on the register. All of the graphics are professionaly restored, including the flags, flash, wheels, key numbers. When we put the register back together, any pieces that are missing or broken are replaced. Broken or missing pieces may include the marble, glass, end caps, and top sign. Yes, if your register is missing the top sign (which it most likely is), the top sign is included in the price of the restoration. Below are some examples of before and after restorations of registers that we have had in our shop. 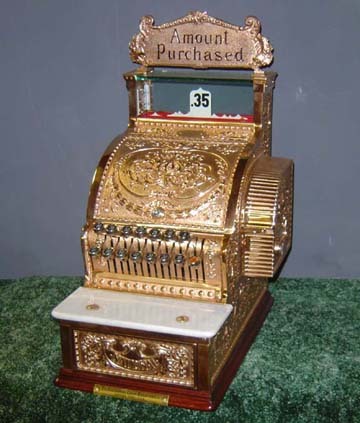 The price of a complete restoration depends on how many pieces are broken or missing on your cash register. Missing pieces are replaced with our parts, or parts gleaned from other registers, which may raise the price of restoration. The price of restoration always includes the price of one of our top signs, unless, of course, your register has the original sign. If you have any questions on what the cost of restoration is, please e-mail us at info@hbacgroup.com with a photograph of your register and we will be happy to give you an estimate on the cost of restoration. When you send your register to our shop for restoration, once it arrives we will go over the register and try to give you a better price on the cost of restoration. The amount of time the restoration takes depends on the size of your register and the backlog of registers to restore in our shop at any given time. We do not require deposits for restoration, however, once the register is restored, payment is due. If payment is not arranged within thirty (30) days of the date the restoration is complete, there will be storage fees assessed.